MOMAY’s family tied her up outside since she was a pup, leaving her all alone to fend off the elements come rain, snow sleet, or hail. The physical toll this has taken on the pup is quite visible as evident by the matted fur, lice, and tick infestation, slowly bringing her down. Sweet MOMAY is so overwhelmed and she needs some help now to finally get the love and care she deserves. Please SHARE, she's SO precious She need a FOSTER or ADOPTER NOW. #A4269676 My name is MOMAY and I'm an approximately 8 year old female Chihuahua. I am already spayed. I have been at the Carson Animal Care Center since 3/3. I will be available on 3/3. You can visit me at my temporary home at C237. 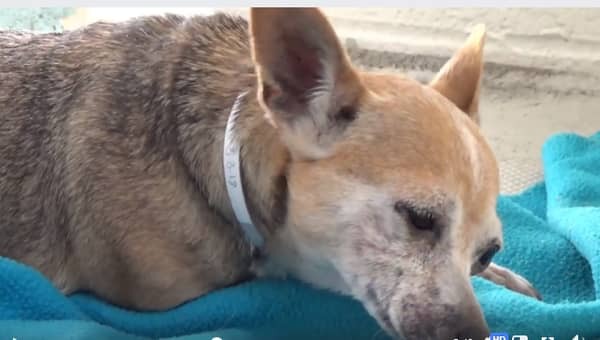 1 Response to "Adult chihuahua tossed in kill shelter like trash, is just too sad to lift her head anymore"
I’ll adopt her but I’m all the way in Maryland, idk if you guys do transport?